On a Saturday in 2002 I managed to get away for about twenty four hours total. The memories of my one night in Tarboro are still so vivid that I want to share this story. It would be eight or nine years before I started writing a blog about my bicycle adventures. I had seen Tarboro a few times before, stopping briefly on car drives to the beach. Tarboro is the prettiest small town in North Carolina, rivaled only by that other Down East destination Edenton. Both exude Southern gentility. With a population of just eleven thousand, this short visit helped underscore how interesting such a town could be. Tarboro is about a hundred miles east of Chapel Hill and twenty-something miles west of Rocky Mount. I had first heard of Tarboro twelve years earlier, back in about 1990 from a longtime friend of my wife’s. The friend was from Greensboro. She had been deeply in love with a guy from a Good Family of Tarboro. The relationship had ended and she was having trouble getting over it. She regaled us with stories of various social events, fancy outdoor picnics and barbecues. Tarboro abuts the Tar River, and a couple times she was in the car with us and the highway crossed the Tar River. Both times she pointed out “That is the oldest river in the world!” Anybody from Tarboro will tell you that only Tarboro and Boston, Massachusetts have a Town Common, which is a wide grassy space in the center of town. The friend seemed to love everything about Tarboro. I had been impressed by its architecture and town planning but she loved it for its people. Another friend who I did not know as well in 2002 but have since come to know better is our Chapel Hill friend Martha. She has the most pleasantly distinctive and cultured Southern accent of anyone I know. Martha has close ties to Tarboro. She grew up in Elizabeth City but both her parents were from Tarboro. Her father is a retired doctor. Her mother, known as B2 was an artist who died relatively young. Martha describes B2 as loving and vivacious. So in 2002 I decided to check the place out by bicycle. I parked our minivan about thirty miles out of town, pulled the bicycle out and pedaled off to see what I could find. I got into Tarboro just as it was getting dark. I rode up to the Ramada Inn on the 64 Bypass, but having to stay on out the highway defeated the purpose of this trip. Pretty much in the dark I pedaled back into town. On the north side of the Town Common there was a sign for a bed and breakfast. I biked up to it, parked the bike, walked on the porch, and knocked on the door. If it was not this same building, then it was a building that looked very similar to this. A woman, maybe sixty years old, answered the door. She said they normally did not get walk-up business. She eyed my bicycle outfit. She hesitated a second and then said sure, they had a room. I negotiated a price, parked my bicycle on the porch and she showed me to my room. She asked “Do you drink?” When I said sometimes, she replied that I was welcome to join her and her husband in the library. He was an interesting old guy. I got the feeling that meeting and talking to their guests was the highlight for this couple each evening. They were not even Southern. They had been attracted to the beauty of this town and had moved here to operate this B&B. I cannot remember what we talked about, but I am sure I ended up telling them half my life story. I was drinking one of the stiffest gin drinks I have ever had. He was pouring his own second or third while I was still nursing my first. We did talk about restaurants in town. The B&B overlooked the block-wide Common and the downtown commercial strip was on on the other side. My hosts said that there were really only three places to eat. 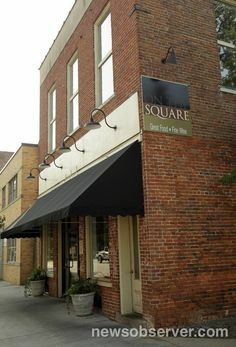 The one I should definitely NOT eat at was the restaurant called On The Square. It was a new place. The food there looked unusual. They said the prices were “ridiculous.” After an hour long cocktail session I decided to escape that second drink and go eat. I staggered out of the library onto the porch, the onto the sidewalk to walk downtown. Of course I ended up eating at On The Square. It was one of the best meals I had had in a long time. I sat by myself at the bar. The other bar seats remained empty the whole time I was there. In fact, at about seven-thirty there really was hardly anyone eating there. The room was nicely furnished but brightly lit. Gradually, the place did fill up. As I remember it had only about eight tables. A lunch place, they had only recently opened for dinner one or two days a week. The people eating there all looked well-to-do, dressed in a Southern country club manner. They all seemed to know each other, exchanging Southern fake-nice kisses. I heard women exclaim to each other “It’s so nice to see you” in high pitched female voices. Back in 2002 most small North Carolina towns did not have serious fancy restaurants like this. Such places have multiplied in the years since. I do not remember what I ate but it was all delicious, eating this three course meal while reading The New Yorker magazine. Towards the end, somebody who worked there, who looked somehow non-Southern, walked up and wanted to chit-chat. What he really wanted to know was, what was I doing here? Why would some random guy be sitting in Tarboro reading The New Yorker, eating by himself? He was the co-owner. He said that they did not normally get people like me as customers. He told me something about himself. He and his wife had been working as sommeliers at Windows on the World in New York, on like the hundredth floor of the World Trade Center. They had seen their entire working world be destroyed in a flash in September 2001. They had both been obviously freaked out by this. His wife hailed from the town of Tarboro, North Carolina, so they retreated here and acquired this little space. The restaurant had only recently started serving dinner. I later found out that both of them were sommeliers with serious credentials. He told me he often visited Chapel Hill. He said that being from wherever he was from, he needed to get out of Tarboro sometimes and Chapel Hill was the closest respite. 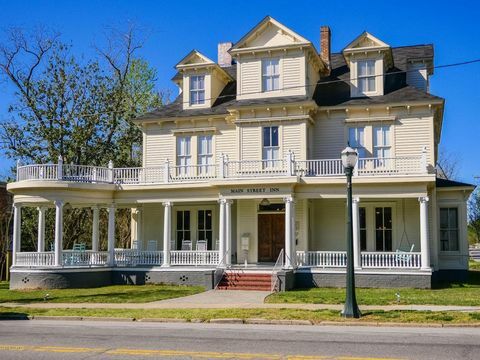 On The Square has gone on to be a successful restaurant in Tarboro. It had been a great dinner. I strolled around through the historic parts of town before walking back across the Town Commons to the B&B. The next morning I had the obligatory Breakfast. I remember being served this breakfast at a fancy dining room table, covered with lace, candelabras, and nicknacks. The room had a soaring high ceiling. It all looked like someone’s rich grandmother’s dining room, circa 1951. I did not see my male host that morning but my hostess seemed to have lots of energy. Not only did my hostess cook me bacon and eggs, but sat next to me and conducted a long diatribe directed at Bill Clinton. Even though he was no longer president she still had so much resentment towards that man. Once, I made the mistake of trying to reason with her; this only made matters worse. Still, we were all smiles when I packed up and walked down the stairs off the porch. Waving goodbye, I rode the thirty miles back to the minivan. I was home in Carrboro by mid-afternoon.